Are you looking for business building tips and ideas? 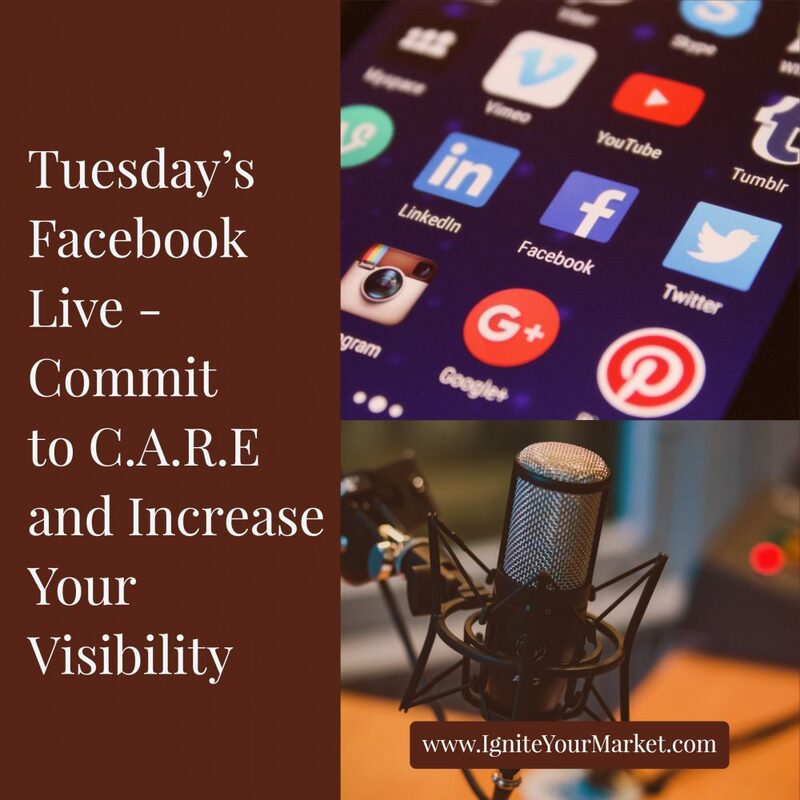 I’m live every Tuesday at noon (EST) on the Ignite Your Market Facebook Business Page. Join me live or watch for the replays on my blog – The Spark. “I feel invisible on social media” – That is the answer I received at a networking event when I asked the question “What is your biggest social media need/challenge?” Many businesses do feel like no one is listening to their social media efforts, do you feel the same? Becoming visible on social media takes time and work over a long period. It is very difficult to do if your foundation isn’t strong. To build your foundation you need to Commit to C.A.R.E. (Consistency|Action|Relevance|Engaging). For example, my content creation calendar includes a minimum of one post 5 days a week on Facebook. Each day of the week have a different type of content, Monday are my Ignite Your Market Challenges, Tuesday Facebook Live, Wednesday Quotes, Tuesday Curated content (sharing other people’s content) and Friday is a Fun Question. I create 90% of a week’s content in one block of time. I typically have a theme for the week that runs through all my content. I write one article and I use it to create my social media content, blog posts and newsletter. I well I schedule social media time 1 to 2 times a day so I focused on the quality of my shares, comments and answers. Action – Create a Call to Action in your content, make them simple and implementable. Ask your read/listener to do something. Action = Engagement. For example, ask them to share their experiences in the comments. If you are sharing a tip ask them to try it and come back and share how it worked. Relevance – Make sure what you are sharing is relevant to your audience/market. Stay on topic; it can be outside your expertise but still relevant to your audience. For example, if you’re a dietitian who works with people who have diabetes it makes sense to share content about fitness. However, it doesn’t make sense to share content about financial freedom. Engaging – You need to post content that is interesting, that makes people think, that makes them want to come back and interact with you. Your content needs to add value so they remember and following you. This is key to getting your followers to “Know, Like and Trust” you. Commit – This is where businesses struggle the most. We start posting on social media, on our blog and sending newsletters and then things get busy or we get discourage and we miss a few posts, then a few more and eventually we stop altogether. I know because it has happened to me and it cost me part of my audience. People may not read everything you share but they are more likely to be aware of your business if you are sharing good content frequently. Bonus Commit – One way to increase your visibility on social media is to participate in other people’s groups and pages. Pick 3 to 5 groups that share your idea market, visit them several times a week and add valuable comments/content following the group’s rules. If you have the right groups and you are adding value people will become aware of you. For example, if you are a website designer be active in a business coach’s community. Having a Content Creation and Management System that focuses on Committing to C.A.R.E. will reduce the amount of time it takes to market on Social Media, increase your visibility and make it easier to outsource steps in the process. Do you feel invisible on Social Media? What is your biggest challenge? Please share below.